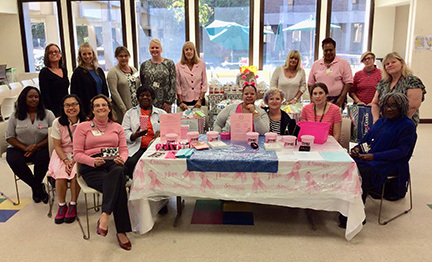 Volunteers and members of Mercer's Chapter of AAWCC assembled and delivered 324 care bags to Breast Cancer Resource Center of Princeton in observance of Breast Cancer Awareness month. Stefanie Williams Carthan organized a "Think Pink" raffle which raised $125 for BCRC of Princeton. 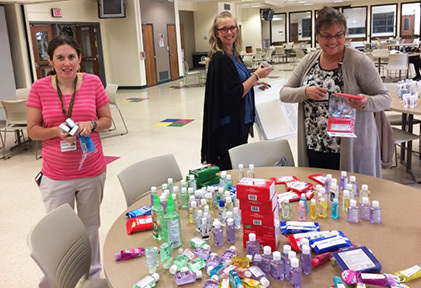 From left to right: AAWCC President Erin Cahill-Wetzel, Stacie-Anne Hannawacker and Shelley Munn assemble care bags to help provide a bit of comfort to individuals undergoing chemotherapy. 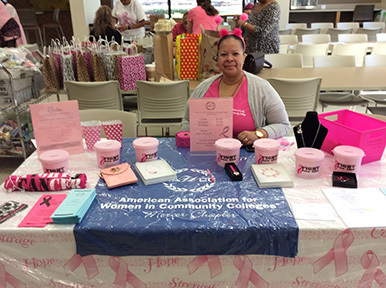 WEST WINDSOR -- Members of Mercer County Community College’s (MCCC) chapter of American Association of Women in Community Colleges (AAWCC) made it their mission this month to “Think Pink” for Breast Cancer Awareness Month as they focused on a service project benefitting the Breast Cancer Resource Center (BCRC) of the YWCA-Princeton. call for donations of tissue packs, hard candies, fluffy socks, activity books, mouth rinse and more in order to construct “Chemo Care” bags, a collection of items useful for individuals undergoing cancer treatment. The college community responded to the call and answered in both donations and time as faculty members, staff, students and members of AAWCC worked to create more than 320 care bags for BCRC in just over an hour. AAWCC President Erin Cahill-Wetzel was overwhelmed with the amount of donations that poured in, as well as the turnout for the day. The project netted care bags that will help 324 women coping with cancer. MCCC athletic department staff members Cahill-Wetzel and Mike DeAngelis delivered the bags to the BCRC of Princeton, a volunteer-run organization that offers programs and services for those affected by breast cancer. “The Resource Center was truly appreciative of all of our efforts, and we are looking forward to helping them again with Breast Cancer Awareness Night on January 25,” Cahill-Wetzel said. AAWCC is a leading national organization championing women and presenting them with opportunities to maximize their potential. All members of the MCCC community are encouraged and welcome to join the Mercer Chapter of AAWCC. For more information, including a list of upcoming events, visit Mercer's AAWCC web page. For information on the Breast Cancer Resource Center of Princeton, visit BCRC's website. View Facebook photos of AAWCC’s “Think Pink” Day of Service here.